CellarPro cooling systems are designed to provide optimal storage conditions for wine cellars and wine cabinets with advanced engineering and technology. 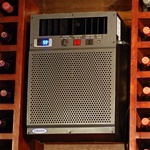 CellarPro gives wine collectors and enthusiasts control over both temperature and humidity in their wine cellar. These CellarPro cooling units are designed to exactly specifications by people with a passion for cooling technologies and built from state-of-the-art materials. CellarPro 1800 cooling system designed for small wine cellars and residential wine cabinets that are located in a temperature-controlled environment. Provides outstanding performance, adjustable humidity control and quiet operation. Designed for wine cellars up to 800 cubic feet and rated for interior & exterior applications. Designed for wine cellars up to 1500 cubic feet and rated for interior & exterior applications. Designed for wine cellars up to 1000 cubic feet and rated for internal or external (see notes below) applications, CellarPro's Split 4000S 1/3 Ton Nominal refrigeration system allows the noise from the condensing unit to be removed from living areas, and eliminates the need for large holes in your cellar wall. This is achieved by separating the evaporator unit from the condensing unit. unit from the condensing unit.